Since about a month, my MBPr sometimes starts up it’s fans and is getting really hot. 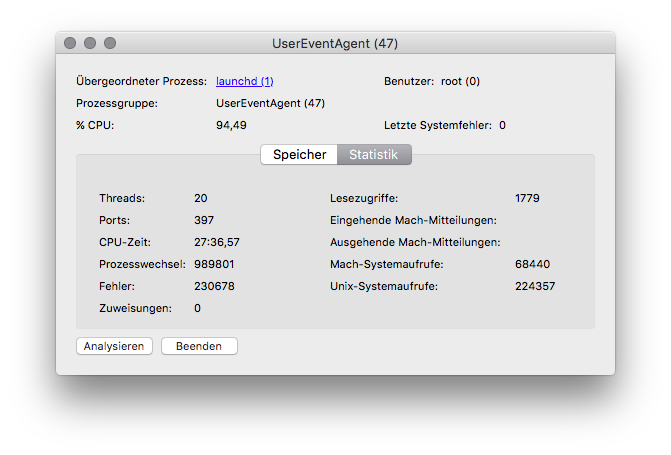 The activity monitor tells me, that this is because of the UserEventAgent, which runs with 100% CPU usage. This spike can last for about 10 to 30 minutes and then everything goes back to normal. There seems to be no reason behind it. There is no pattern, when it starts and nothing I can do, to stop it. The same pattern still applies when I don’t do anything and just wait. It still takes a serious amount of time, until UserEventAgent goes back to normal. I also checked the log to find out, if there are any messages, that could give me a hint, but the messages differ every time. There is no message that always causes the UserEventAgent to start up the fans and there is none to stop it. Is there any way to find out, what causes the UserEventAgent to go haywire? Maybe a terminal command, or something like that? As a note: Testing it will take some time, because I will have to wait for the next spike to test solutions. I just got a new spike. 02.01.16 12:18:14,403 UserEventAgent: Failed to send message because the port couldn't be created. 02.01.16 12:18:17,234 UserEventAgent: Failed to send message because the port couldn't be created. 02.01.16 12:20:27,799 UserEventAgent: Failed to send message because the port couldn't be created. 02.01.16 12:20:30,921 com.apple.xpc.launchd: (com.apple.UserEventAgent-LoginWindow) This service is defined to be constantly running and is inherently inefficient. 02.01.16 12:20:44,822 com.apple.xpc.launchd: (com.apple.UserEventAgent-Aqua) This service is defined to be constantly running and is inherently inefficient. There is no additional message when the process returns to its normal CPU load, but anyone of you knows what to look for in the logs?! Lately the process won’t go back to normal after some time. I have to restart my mac in order to bring back a normal cpu usage of the UserEventAgent. I tried to close all running apps, but that does not seem to have any effect at all. My guess is, that it might be a driver related problem, but I have no clue how to track it down. Is there any way to do that? Ok, currently even a restart does not help. Battery is dead in an instant and fans are constantly running at full speed. I am so annoyed! Ive just solved this by disconnecting and reconnecting the power cable from Mac. The light was green, battery indicator on the screen was saying that the battery is charged but maybe there was power cable tip misalignment or something that caused this issue. Same issue. I completely reinstalled 10.11.3 on an erased drive and the problem persists. This is an OS X bug so send Apple a bug report. But you must remember to load it prior to the next boot or in safe mode, or else many things will fail at the next boot. Unfortunately, we must wait for Apple to get their act together on this one. In my case it seemed to be the Wacom tablet driver. I just updated to this driver, and it seems to work fine. Not the answer you're looking for? Browse other questions tagged cpu macos .